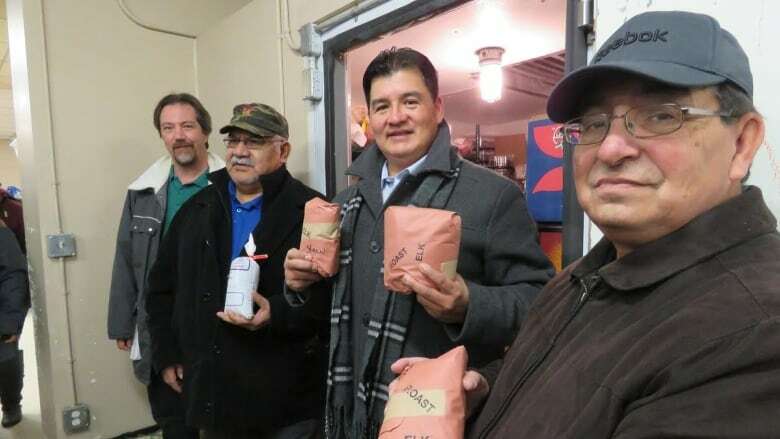 ​The Federation of Sovereign Indigenous Nations is delivering more than 900 kilograms of elk, moose and wild boar meat to food banks and shelters in Saskatchewan this holiday season. FSIN Chief Bobby Cameron says the deliveries ensure Indigenous people who aren't able to hunt still have access to traditional food. "My late father always told me, 'each time you kill an animal, give thanks, leave tobacco and always share the animals you kill with your people,'" said Cameron on Monday. "Sharing food for many Indigenous people is a way of life." Cameron said the meat was collected by hunters across the province. The goal of this week's deliveries is to bring traditional food to Indigenous people living in urban centres, particularly the less fortunate. But Cameron said there were also hunters doing similar deliveries in smaller communities. "Every community has those treaty hunters, those trappers and gatherers, that do this," he told CBC Radio's The Afternoon Edition. "And we want to say a big shoutout to all those individuals, all those thousands of hunters, that do that." Cameron's first delivery was to the Prince Albert Food Bank on Monday. The food bank's executive director Wes Clark said there was a great need for the food and it would be appreciated by his clients. "About 90 per cent of our clients are Indigenous, and the vast majority who access our food are families and children," Clark said. Cameron will also deliver wild meat to a shelter in North Battleford on Tuesday, another shelter in Yorkton on Wednesday and a soup kitchen in Regina on Thursday. He also plans to make a delivery in Saskatoon next week.